What if Pope Francis surprises us once more? On July 1-4, another meeting of the Council of Cardinals appointed by Pope Francis to counsel him on the Curia reform and on the government of the universal Church will take place. It is an important meeting, since it would reportedly set for the first time the new ‘blueprint’ of the Roma Curia, perhaps setting a new Secretariat, that for the Communication. As is his custom, Pope Francis will just listen. And, after listening, he will decide. Once more, he could surprise us. Pope Francis most recent homillies at his morning masses in the Domus Sanctae Marthae often touched on corruption and on how easily people can give into the seduction of webs of power. Pope Francis address this issue as well in the general audience last Wednesday June 11. Pope Francis follows a pastoral approach, and when he preaches, he does it according to the Gospel of the day. At the same time, he uses the Gospel of the day to speak out about things he really cares about. Adressing the issue of corruption is painful but it was a must. The most recent attacks against Cardinal Tarcisio Bertone, Secretary of State emeritus, would have convinced Pope Francis to take a precise and definitive direction. It is rumored that Pope Francis met the Secretary of State emeritus. Bertone was surprised by being the target of attacks, at a time when he is no longer in charge (his holding of the post of Chamberlain will come to and end in September). Pope Francis assured him of his support. Moreover, he reportedly said that he had found out who are the people moving behind the scenes, and that he would soon take appropriate measures about it. Taking into account this information, Pope Francis moved to break the webs of power characteristic of the Curia in the recent past. A Curia that – since the time Angelo Sodano was Secretary of State – was closely linked to Italy. Meanwhile, Italy – since the times of the Banco Ambrosiano scandal – used the Vatican as a scapegoat for some issues and as a symbol of a privileged relationship with the Church in other issues, as it saw fit. From this Italian circle came the leaks, people who work at the Italian-Vatican border confines in a way that can even be considered reckless, conflicts of interests of Italians that deem the Holy See an extension of their country more than the universal patrimony of believers in the world. Pope Francis is working to break this web. He is facing some difficulties. The men of the Curia of the old days have worked behind the scenes since Benedict XVI’s resignation. Cardinal Angelo Sodano, the point of reference of these men, managed the pre-conclave meetings in his capacity of Dean of the College of Cardinals. The meetings were not about a vision. They simply highlighted the need for a more pastoral Pope, one who would reorganize the Curia and give “the gang of diplomats” and their views more importance. Read in retrospect, the homily ‘pro eligendo Romani pontifice’ Sodano delivered before the conclave sounds like an endorsement of Jorge Mario Bergoglio’s personality, a clear reference to the intervention the then archbishop of Buenos Aires made during the pre-conclave meetings, which impressed the cardinals very much. Until now, Pope Francis has governed with an eye to the pre-Conclave meetings, because – he admitted himself – he did not have a blueprint for the Church. The return of the gang of diplomats of Sodano was evident in some of the Papal appointments, the most evident being that of the Secretary of State, Cardinal Pietro Parolin. 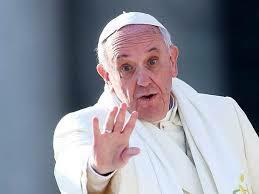 Pope Francis then started to take different decisions, leaving the men of the Curia of the old days stunned. A clear signal was the decision to give the Holy See a more international profile. This culminated with the appointment of the new board of the Financial Information Authority, the Vatican’s financial watchdog. The Italian world working the Italian-Vatican border is not there anymore, at least in financial issues. Leaks of information – even the former head of the Institute for Religious Works, Ettore Gotti Tedeschi, was accused of leaking information when he got a no confidence vote from the Council he presided – are more difficult now. Pope Francis seems really set to put an end to all the “dangerous liaisons” of the old Vatican world concerning financial issues. The recently established Secretariat for the Economy and Council for the Economy are a clear signal of this. At the moment, the two bodies are working to draft their statutes, and it is yet to be seen which responsibilities and tasks they will take over. In any case, Parolin’s Secretariat of State risks to lose a lot power over financial issues, and to be ‘de facto’ diminished to a Papal secretariat, one of the Secretariats to be established and not weighing that much. Pope Francis may surprise us even further, perhaps entrusting diplomatic functions to other bodies in addition to the Secretariat of State. The invocation for peace which took place June 8 in the Vatican Gardens was mostly organized by the Prefecture for the Pontifical Household together with the Custodian of the Holy Land, Father Pierbattista Pizzaballa. It was not a purely or preeminently diplomatic event, since it is the strength of prayer for diplomacy that the Pope believes in. But it was a historical event, even if perhaps it will not lead to concrete outcomes because of the patchwork manner in which it was managed, which included some risks (like the improvised words in the mufti’s prayer asking for death to the unfaithful and referring to Jerusalem as the holy city of muslims, which created some problems). Anyway, the event promoted the notion that peace is possible. Pope Francis may also surprise us for what concerns the streamlining of the Curia and the future of the Vatican dicasteries. His guidelines are those derived from the Second Vatican Council’s Constitution Gaudium et Spes.” The “Gaudium et Spes” inspired the establishment of the Pontifical Council for Justice and Peace. This Pontifical Council has been the object of criticism in recent years, targeted by that wing of diplomats that deemed it dangerous to give it autonomy and an international vocation (which deviates from their ‘good neighboor’ policy). However, Justice and Peace may gain a renewed importance thanks to the Pope’s sensitivity to social issues. The Pope entrusted the members of this Pontifical Council (among many other people and offices, including – it is rumored – an Austrian Jesuit who have worked in Argentina) to produce a draft for a possible encyclical on the environment, which he would like to issue at the beginning of next year. The first draft presented to the Pope was inspired by Benedict XVI’s human ecology. Pope Francis reportedly liked it and asked them to carry on along this line. The Pope may surprise us even more if this encyclical would be instead a document written with the Ecumenical Patriarch of Constantinople, Bartholomew I, a main character behind the Papal trip to the Holy Land and the invocation for peace. Sources maintain that writing a document with Bartholomew may be considered one of the steps to the convocation of a fully ecumenical council (i.e. gathering all Christian denominations and churches, including the Orthodox churches) in Nicea in 2025, marking the 1700th anniversary of the first council of Nicea which took place in 325, before the 1078 schism, and provided some of the fundamental pillars of the Christian faith. These are all the areas where Pope Francis may surprise us once more. Meanwhile, the men of the Curia of the old days, who at the beginning of the Pontificate seemed to be in control again, are now feeling sidelined. So much so that some of them are already campaigning for the election of the next Pope, thinking that, perhaps, Pope Francis will resign when he turns 80, as it is customary for the General of the Society of Jesus. Pope Francis seems to be aiming at two things: to put the Church in a state of permanent mission, and to break the circe of corruption that has ruined the image of the Chuch. He will have to fulfill these goals by going beyond the agenda of the media, which is fed by his very open responses. At the moment, he is reshaping his revolution. Benedict XVI left him the house in good order. It is now his turn to scrub it cleaner where it needs to be. 7 Responses to What if Pope Francis surprises us once more? It is surely no coincidence that Italy has been both the seat of the Catholic church and a byword for corruption throughout the West and those countries that are familiar with it. Recently, although surely not a revelation, it was classified in some survey or other, as the most corrupt country in Europe. Nor is it known and deplored only foreigners, but perhaps more so even by its own citizens. I can’t bring myself to mention instances, in normal day-to-day life, where, a young Italian told me, people are expected, or instance, to give presents to officials, as they seem so improbable! This was in the early seventies. I can’t imagine it would have diminished in the interim. Didn’t mean to be ‘Anomimo’. 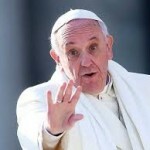 An encyclical on the environment? I hope atmospheric SCIENTISTS are going to consult. Sorry. Forgot to write my particulars for the post I just sent. But do you have a fifth-coloumnist there with you? That photo makes it look as if Francis is sucking his thumb! And journalists are usualy incredibly astute at finding photos to fit articles. You’re right, TomD. Was that really the original photo? There was one photo published immediately in a couple of organs, in which he did look as if he was sucking his thumb. Easter, will the Church be risen again?